I have more exciting news! Author Stephanie Burgis will be doing a guest post here in April. She’s doing a blog tour for the US release of her third book, Stolen Magic, which comes out April 2! I got impatient and imported it from England when it came out there. It’s pretty amazing, but I’m going to save my review for the last post of March right before the book is due out. Because I like to tease you. But, you might be saying to yourself, the title of this blog post seems to indicate that there is a giveaway. What does that have to do with anything? Renegade Magic, book 2 of the Kat, Incorrigible series, came out in paperback this past Tuesday. So, to celebrate it’s release date I’ve created a pair of earrings inspired by Kat’s trip to the roman baths in Bath, England. While these coins are a little smaller than actual Roman currency coins, jewelry, finger foods, and needleworking supplies have all been found in the drains of Roman bath houses. So Kat might have found some coins like this during her unauthorized dips into the baths. 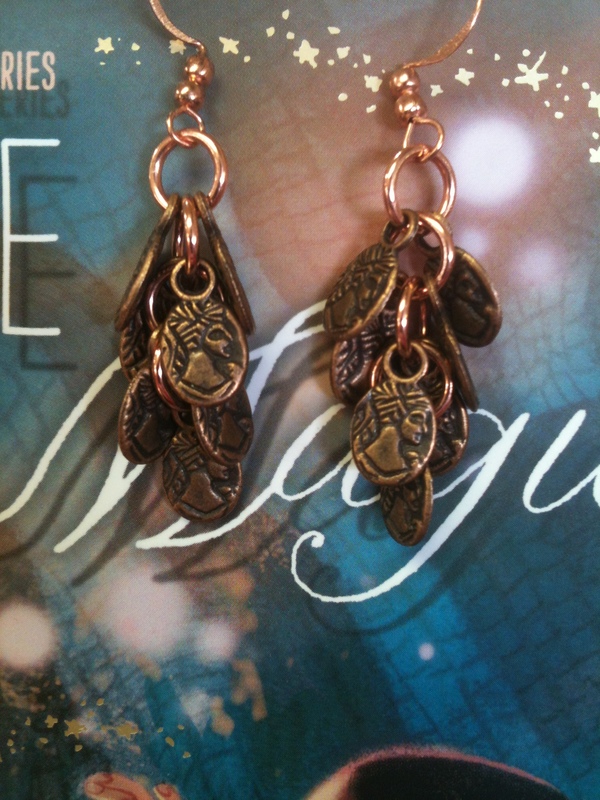 The giveaway will run until March 30 and I’ll ship the earrings anywhere in the world. They’re currently on copper earwires, but that can be changed to surgical steel if you’d prefer. To enter the giveaway all you have to do is leave a comment here. You can earn extra entries by following Stephanie on Facebook or Twitter. It’s that easy! Honestly, I’d love to go on a trip to see my friends, that’s my first choice. But if my friends were coming along, and we could go anywhere, I’d go on vacation to Scotland! All of Scotland. It would be a very long vacation. How did I miss this post? I’d love to enter the giveaway. 😀 Gorgeous earrings, Sara! We need to get together and make jewelry/teach Mary how to make jewelry. My big box of Kenyan beads are going to waste. That would be very cool. I’d be happy to once my rehearsal/art show schedule calms down a little. I place would you most to go on vacation is Yellowstone National Park. Thanks for the opportunity. I would love to go to Ireland! so green and lush! I would love to see the pyramids!